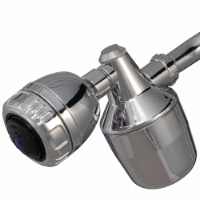 Low-Offset Universal filter is designed for smaller showers where head room is a premium. It includes a Dial-A-Date® filter replacement indicator. Fits all shower heads and handles. Filter lasts roughly 6 months. Available with or without a showerhead. Installs between shower arm and shower head. The reversible filtration cartridge uses patented Chlorgon, a non-carbon media used to remove more chlorine at a wider temperature range than any other, making it especially effective in hot showers.